Rolling across the room. He can roll onto his tummy and onto his back so there are times when he'll keep going and roll across the room. Scooting across the room. 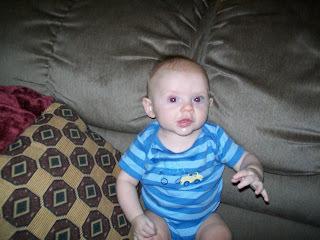 He doesn't yet have the arm strength to crawl, but he does push with his feet to scoot a little ways across the room. Squealing A LOT. Whenever something catches his attention or when he sees something silly he'll let out a loud squeal. He's also still teething. His poor little gums are white and swollen in spots and he wants to chew on everything to ease his discomfort. Poor little guy. We wish the teeth would just push through already.